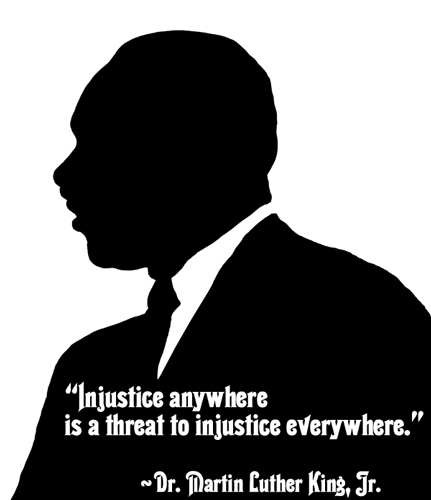 This silhouette of Martin Luther King is based on a public domain image of Dr. King that I found on Wikimedia. I was inspired to create this silhouette after reading Dr. King’s Letter from a Birmingham Jail. It’s amazing how his powerful words resonate today. So many of the issues he was concerned about still exist for members of our society and around the world.
. . . injustice must be exposed, with all the tension its exposure creates, to the light of human conscience and the air of national opinion before it can be cured. Now is the time to make real the promise of democracy and transform our pending national elegy into a creative psalm of brotherhood. Now is the time to lift our national policy from the quicksand of racial injustice to the solid rock of human dignity.